(If you got the allusion I was making in the title... you're a bad person). OK, so two things have happened. I've been needing to get up to speed with Git for work-related purposed (we will presently - hopefully - be converting from SVN to Git), plus I also need to start participating in a coupla OS projects on Git. One of which I'm co-founder of ("ColdFusion UI the Right Way"). I do have an account on GitHub already, wherein I keep all the code metioned on this blog (and other bits and pieces): https://github.com/daccfml, however I pretty much just use that for backing-up, making-public and distributing it between my various computers. I can commit stuff and that's about it. Also Andy Allan's recently written an essential blog article (I mentioned it yesterday, but here's the link again: "Version Control"), and this has already had some people come out of the wood work saying they don't use version- / source-control, excusing it as too hard. Nonsense. By way of demonstration, I'm gonna work through getting Git up and running in this article. I've deinstalled all the Git stuff from my machine, and am starting again. I googled "git download", and unsurprisingly it's the first link. Front and centre are the download links. I'm on Windows, and the current version is 1.8.5.3, and the file is about 15MB. I dunno whether I need to, but I run the install file (Git-1.8.5.2-preview20131230.exe) as an administrator (I am literally doing this as I type, btw). I opt to use Git Bash only to start with, btw (this is the default, that said). I've been using Git Bash all along, so see no reason not to continue. I also opt to leave the CRLF handling the default: checkout for Windows, commit for Unix. That gives a more transportable option should the files end up on a *nix system. And now it installs. That's it. At this point I cheat slightly and re-check I can now connect again to my GitHub account before I continue, and I can. So it seems Git's installed OK locally. There's a free Git orientation course on CodeSchool: tryGit. I'm gonna go through this both online, and follow through on my local Git install too. 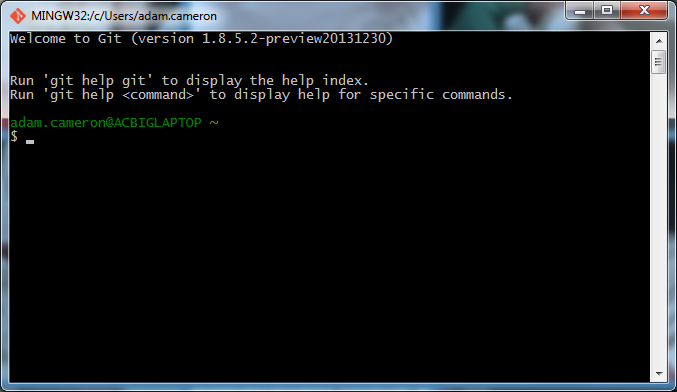 As I said above, I'll be using Git Bash for this, which is a command-line client for Git. There's a bunch of GUI clients for Git too (including TortoiseGit, if you're an SVN / TortoiseSVN user, and wanting to ease your migration), but I find I get a feel for what's going on a bit more if I'm on a command line. NB: if you're one of these people that shrinks away a bit when you see a command-prompt, or a suggestion one needs to use one... please, for the love of god, get over yourself. You're an IT professional (supposedly). Command prompts shouldn't frighten you. They won't bite. And they're not complicated, it's just... well... typing stuff in, and getting results. Exactly the same as anything else you do on the computer. In the screen examples as per above, I'm gonna make the stuff I type a pink-ish colour. The other colours are representative of the colours Git Bash uses on my install. Git Bash pretty much works like a Windows command prompt, except one needs to use *nix style commands (so like mkdir instead of md, and ls instead of dir etc). One doesn't need to know too many of these commands, but general file-system navigation / management ones are handy. I've created that "octobox" (not a new Ortus product, in case you were wondering) directory and made my repository in there as that's mirroring what the tutorial works with. it was really easy to create a repository. Yeah: that's all I had to do. See I've added that octocat.txt file... the status shows it's not in source control yet ("untracked"). that's one thing to remember with source control software, even though one might put files into a repository dirctory, they're not under source control until one makes them be. One thing to remember about Git Bash here... it remembers your command history, so if you want to repeat an earlier command, just use the up/down arrows to traverse your history. $ git commit -m "Add cute octocat story"
Here I've used the -m switch to allow me to add a commit message along with the commit itself. It's best to always add a message when committing, explaining why you're committing something. Notice how the octofamily subdirectory has not be added. It turns out - and this is the first unintuitive thing I have encountered with Git, that the single quotes are meaningful, and in this case seem to mean "do it recursively". Or something. I would have expected a -r switch or something, TBH. Dammit! 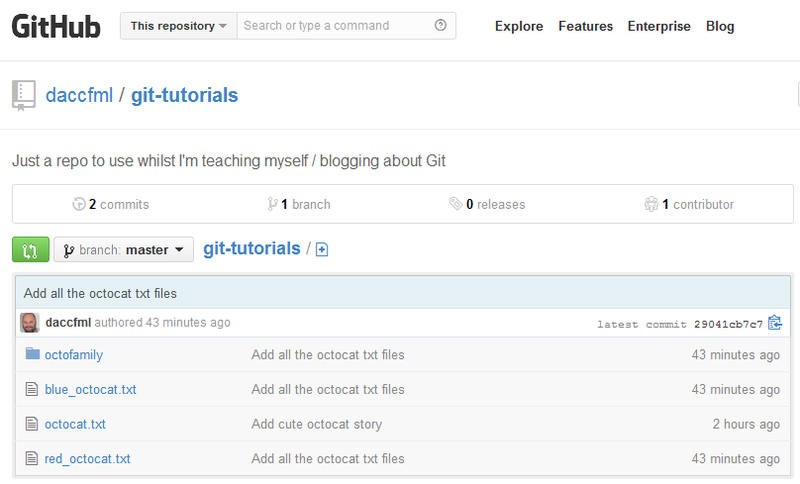 Now I've gone and said I want to remove octocat.txt from source control. Which is not what I wanted. I just wanted to revert my most recent add operation. (HEAD, btw, is just a reference to the most recent commited revision. It's standard source-control jargon). Next the tutorial is gonna get me to push all that stuff up ot GitHub. For me to do this here, I'm gonna have to create a repo on GitHub to receive it. I've already got an account on GitHub, but if you don't have one... go create one. I can't recall what's involved, but it's basically just signing up to the site, from memory. From there I have created a new repository called , which has the URL https://github.com/daccfml/git-tutorials. Oooookay. That is not what I expected. But I googled the error, and found a StackOverflow question (with various answers), and am now working through the instructions in this document: "Generating SSH Keys". Yeah, that fixed it. basically there's a bug of some description in Git 1.8.5, meaning I need to use SSH instead of HTTPS. Or I could downgrade to 1.8.4. I opted to use SSH instead. Right, so now we should be able to push those files! he list of known hosts. Writing objects: 100% (6/6), 570 bytes | 0 bytes/s, done. I then updated a coupla files, and pushed them back up to GitHub. So now I can do an actual pull, and get some updates. What I did on the remote machine is to edit octocat.txt, and add a new file remote_cat.txt. This reports here as a deletion and an add on octocat.txt ("deleting" the old line, and replacing it with two new lines I guess... despite the fact one of the new lines was actually the same old line? Odd), and an add on remote_cat.txt. Here I've added a file octodog.txt, which still needs to be committed. Here I've done a git rm both without quotes and with quotes, in turn. And you can see the lack of recursion in the former, compared to the latter. Writing objects: 100% (2/2), 203 bytes | 0 bytes/s, done. Most of that bumpf is irrelevant to what I was doing, and it's actually pretty cool that Git tells me that a change is afoot and lets me know how to deal with it. Deleted branch clean_up (was 053dabe). Note there's just the one branch, master, now. That was the end of the tutorial. Please note that it would have taken a lot longer to read through all this than the tutorial takes to work through. It's about 15-30min all-up, depending on how long you dwell on things. I actually learned quite a bit from this tutorial, even though it was the second time I did it. I guess I read up a lot more this time, plus the act of blogging it makes me pay more attention to what it was saying. Some of those concepts are more firmly in my head now. Hopefully they'll stick. That's a fair swag of stuff. And that's about enough for me sitting in front of a computer today (this has taken about 6h to write! ).